As it’s been a while since I’ve done a Romance Saturday post here at Shiny Book Review (SBR), I thought I’d serve up a special treat — four reviews of four different types of romances await the reader. And as Valentine’s Day was yesterday, I thought it might be interesting if I treated this more like a dinner — with an aperitif, an appetizer, an entrée (the main course), and a dessert. Our aperitif is by Sherry Thomas and is entitled THE BURNING SKY. It’s a young adult fantasy romance set in late 19th Century England, and features Iolanthe Seabourne, Elemental Mage, and Prince Titus of Elberon, who live in an alternate reality that intersects with England in such a way that magicians frequently cross from magical Elberon into non-magical England without too much distress. Titus is a Prince, but he does not rule as another realm has forced him into vassalage. He’s a teen on the verge of adulthood, doesn’t have any idea who his father was (his mother refused to say before she died years ago in an uprising) and his recently-deceased grandfather was such a bitter old man that Titus could barely stand the sight of him. And Iolanthe is a mage who commands all four Elements — Fire, Air, Earth and Water — even though she doesn’t exactly realize it at the start of the book. More to the point, Iolanthe is the one foretold to kill the Bane — a man who’s lived more than one lifetime and cannot be permanently killed by a normal man or woman. And because mages who can command four elements are rare, Iolanthe was hidden for years and was not trained to the limit of her ability, either, in order to keep her from the Bane’s sight. So when Iolanthe finally betrays herself, she’s a sixteen-year-old on the run. Prince Titus is her only ally, but she doesn’t fully trust him . . . more to the point, the only way to hide her is to bring her into 19th Century England, a place she doesn’t truly understand, and ensconce her at an all-male school, the famous Eton College. And to the Prince’s credit, he quickly does this, as Eton is both his prison and his refuge. Quickly renamed “Archer Fairfax,” Iolanthe excels at most athletic pursuits, outdoes the boys in Greek and Latin, and in general enjoys herself thoroughly. But her feelings for the Prince cannot be denied . . . will they throw off the Bane, or won’t they? And will she ever be discovered as a female in disguise? I enjoyed THE BURNING SKY in many ways, as it’s a quick read with a decent-to-better romance as Iolanthe and Prince Titus are fun characters with a nice dynamic between them. Ms. Thomas seemed to be enjoying herself thoroughly here, and her storytelling had wit and life as well as an understated, age-appropriate passion — all good. However, it’s not a grade-A read. It’s closer to a grade-B read — well-executed, deft, pleasant, and completely forgettable once you’ve turned the pages. Still, I’d read more of Ms. Thomas’s fantasy, no question. Our appetizer is an English historical romance, THE LUCKIEST LADY IN LONDON, also by Ms. Thomas. It stars Felix Rivendale, the Marquess of Wrenworth, and the woman who eventually becomes his bride, Louisa Cantwell. She’s a woman of gentle birth but little money, and feels she must marry well . . . this is a tried-but-true plotline, but there are a few interesting touches. Lord Felix is an appealing rake whose polish masks a ferocious intellect, while Louisa’s charm and light conversation mask the fact she’s his intellectual equal. And it’s because they’re both extremely smart that their sexual passion is so strong, a particularly appealing touch. As usual with the romances of Ms. Thomas, the dialogue is crisp and for the most part well-executed, and the reasoning behind how these two got together makes sense. However — and this is a big however — I found little life to this romance. Lord Felix was mistreated in childhood by both parents, and his pain is palpable, but I don’t see why Louisa would go for him as there’s nothing inside her that would seemingly respond to his pain. Yet she does so without complaint, partly because she wants his immense fortune (which, to be honest, she never hides from either the reader or Lord Felix), partly because he is her intellectual equal and she doesn’t expect she’ll ever find another man who is. If you haven’t read any of Ms. Thomas’s work, THE LUCKIEST LADY IN LONDON should divert you for a few hours. But ultimately, it is nowhere near as good as her two best romances — PRIVATE ARRANGEMENTS or NOT QUITE A HUSBAND (both reviewed here) — which is why I recommend you read those instead. Our entrée is by debut novelist Giselle Marks, whose pleasant Regency romance THE FENCING MASTER’S DAUGHTER is a nice addition to the genre. It stars Edward Charrington, the seventh Earl of Chalcombe, recently of the 3rd Dragoon Guards, and Miss Madelaine Deschamps, the aforementioned fencing master’s daughter. The novel starts off agreeably with Madelaine rescuing Lord Edward from a vicious streetfight. Three armed assailants had downed Edward due to an old war wound suffered during the fighting in France disallowing him to fight at his usual capacity, and he would no doubt have been killed if not for Madelaine and her man-at-arms Henri fighting them off. As one man was killed and another grievously wounded, Madelaine says to everyone that Edward did the deed — and because he’s an Earl, no one questions him any further. Of course, Edward feels guilty that he wasn’t able to handle his own affairs. But as he’d been hit hard on the head and suffered a concussion, he truly couldn’t be faulted. He does his best to find Madelaine again, as he wants to reward her . . . and did she really have the face of an angel? And why are people trying to kill Edward, anyway? He’s just another Lord . . . he doesn’t have immense wealth, doesn’t have any known enemies, and even Napoleon’s men shouldn’t care any longer because Edward is lame and is never going to return to the battlefield. As the romance progresses, Madelaine finds herself falling for Edward, even though she’s vowed she’ll never marry (for reasons that must be read; I refuse to spoil them). So will he manage to convince her that he’s not like other men, most of whom have been roués at absolute best? Or won’t he? All I’m going to say further about the plot is this — I enjoyed it, thought there was some life and energy there, and greatly appreciated the touches of wit Ms. Marks sprinkled throughout her novel. There’s a lot to like in THE FENCING MASTER’S DAUGHTER. The fight scenes are well-executed and lively, the dialogue — what there was of it — was well-rendered, I liked both Edward and Madelaine as characters and wanted them to achieve their “happily ever after” ending, and the historicity was excellent. But there are some weak spots here that puzzled me. For one, much of the plot seemed summarized. There wasn’t nearly enough dialogue in spots to suit me. There was hardly any internal monologue — what the characters are thinking has to be deduced from external events instead. I didn’t see any reason for this, either, because what Ms. Marks did is actually harder to render than giving readers a few quoted thoughts now and again. Further, because the historicity is so good, Ms. Marks actually went a bit overboard in her use of description. It is a perfectly period Regency romance — I cannot find fault with it on that score — but for modern-day readers, the descriptions alone may be a bit too much to bear. With a top-notch editor, Ms. Marks’ novel would’ve been a guaranteed hit, at least in this quarter — a solid A. But because Ms. Marks did not have that top-notch editor (whoever edited for her did a workmanlike job and was competent, but didn’t address the faults listed above), this is a B-level debut instead. Still good. Still interesting. Definitely memorable. I’d gladly read it again. But it should’ve been even better. 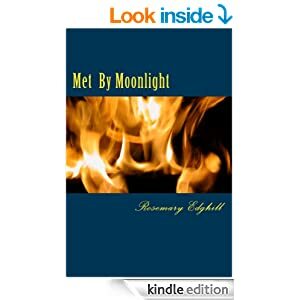 Finally, our dessert course has been prepared by the redoubtable Rosemary Edghill, whose time-travel romance MET BY MOONLIGHT is back in print and available at Amazon as an independent e-book. Diana Crossways is a modern-day Wiccan priestess from Salem who owns a bookshop. It’s a stormy Halloween night (Samhain, by any other name) and she just wants to get to her coven meeting, but a rare book has been dropped off that requires her attention. As Diana takes charge of it and starts to turn the pages, a bolt of lightning knocks out power to her shop. Something compels her to go out into the storm rather than stay inside in safety, then another bolt of lightning sends her elsewhere . . . to a forest in England directly before the “Glorious Restoration.” (If you’re not up on your English history, we’re in 1647. Thomas Cromwell has taken charge of England.) A coven is there to receive her — dripping wet, shivering with cold — and while Diana does see an enigmatic presence as well (a young man, dark and handsome, but somehow alien), she cannot dwell upon it. Diana’s taken in by Abigail Fortune, one of the coven members, and is passed off as Abigail’s niece, Anne Mallow, from London. Abigail doesn’t know what Diana is, but as it was Samhain and that’s a holy night to those of the traditional faith (not yet called Wiccans, but the forebears of same), Abigail doesn’t question Diana overmuch, either. “Anne” finds herself trapped in time without the creature comforts she’s used to, amidst a rigid society made worse by Cromwell’s depredations, and cannot quite catch her bearings. But then she sees the young man again, this time dressed in severe plainness, and is told his name is “Upright-Before-the-Lord.” Of course, this young man’s name is nothing of the sort, but unlike Diana, when this young man was found in the forest, he was taken in by Puritans of a particularly obnoxious vintage. How can these two lovers be united, considering the times they live in and all that stands against them? How much help can Diana expect from the coven, especially as they must be discreet as this definitely is “the Burning Times?” And will Diana ever manage to get home again? All of these questions are answered in ways that are satisfying, realistic, and historically honest — a neat trick that very few writers are able to pull off. MET BY MOONLIGHT is perhaps the best time-travel romance I’ve ever read. It has heart, style, wit, verve, historicity, realism, and emotional honesty — a phenomenal and poignant read, something every romance reader should enjoy if they have any sense or brains about them. THE BURNING SKY — B. THE LUCKIEST WOMAN IN LONDON — C.
THE FENCING MASTER’S DAUGHTER — B. MET BY MOONLIGHT — A-plus. As it’s nearly New Year — and as I have two romances I keep meaning to review here at Shiny Book Review — I decided to make a virtue out of necessity, which is why tonight’s 2-for-1 SBR special features the work of two highly distinct authors — Sherry Thomas and Marie Lu. Both are romances in one way, shape or form, but are set in wildly disparate milieus. The first romance to be reviewed tonight is Sherry Thomas’ TEMPTING THE BRIDE. This is the third book in her Fitzhugh trilogy that’s set in England during the Victorian era; the previous books, BEGUILING THE BEAUTY and RAVISHING THE HEIRESS, were reviewed here. (I also reviewed four previous Thomas romances here.) BRIDE features Helena Fitzhugh, a London publisher in love with a married man, and David Hillsborough, Viscount Hastings, who’s loved Helena for a long time but hasn’t been able to show it appropriately (partly due to Helena’s love for the married guy). The main reason David and Helena don’t have a romance at the start of this novel is because David, to be blunt, was a very bratty teenager when he first met Helena and said some really obnoxious things to her. Over the years, that pattern of behavior has continued even though everyone else in Helena’s family (sister Venetia, featured in book 1, and brother Fitz the Earl, featured in book 2) has known for a long time just how deeply David’s feelings for Helena lie. Then they have to go explain things to Helena’s brother and sister, which is awkward and upsets Helena. She ends up running out into the middle of the street, takes a head injury, and gets amnesia. I’m sure, thus far, anyone who’s reading this review that doesn’t know about Ms. Thomas or her writing skill is wondering why I’d bother with this, considering the hackneyed plot device employed. Yet TEMPTING THE BRIDE, far from being an irredeemable mess, is by far the best of the Fitzhugh trilogy because it focuses on David and his doomed love for Helena and shows just how good a man David really is when he’s not behaving like a jerk. So the two get to know each other without any of Helena’s preconceived notions (as she’s lost all of her adult memories, plus most of them from her late teens), and they fall in love. But what will happen when she regains her memory? And what is she likely to do with that married man who’s kept her on the string all this time? While I can’t go into any of that (or I’ll blow any of your potential reading pleasure out of the water), I can tell you that I found it to be not only plausible, but highly engaging. Put simply, TEMPTING THE BRIDE is Ms. Thomas at the top of her game, which is a welcome thing to read indeed. Which is why if you love romances and you haven’t read any of Sherry Thomas’s books yet, you’re really missing out. Next up is Marie Lu’s LEGEND, a dystopian romance set in what could be the very near future. The United States has broken up into disparate parts, one of them being the Republic of California (called simply “the Republic,” possibly to save steps). The Republic is a cold, cruel place that’s based off one thing: military achievement. Everyone takes a test at age ten to find out what he or she is going to be, and the top-rated thing you can possibly do is to go into the military or work in military research — nothing else need apply. Our two characters here are June, born into an elite military family, and Day, who comes from the bottom end of the economic ladder. Both are military prodigies, but only June has been encouraged — Day was basically left for dead by the cold, cruel, corrupt elders running the Republic. Both are in their mid-teens. Both are extremely bright. And both have many military skills that manifested at a surprisingly early age — Day’s out of necessity, June’s because she’s been pushed to become the best. Normally these two would never meet as Day’s a fugitive and June’s already in the Republic’s military (albeit as the equivalent of a cadet). But then June’s brother Metias is murdered, and Day becomes the prime suspect. But there are secrets within secrets, wheels within wheels. Things are not as they seem, which is why Day and June must meet, take each other’s measure, and possibly form an alliance in order to succeed. Yet everything June’s learned has told her that Day is automatically the enemy, while Day, in turn, has learned that no one from the Republic — not even someone as young as June — can be trusted. What will happen to these two distinct individuals, especially if June cannot shake off her early conditioning? Overall, LEGEND is an enjoyable and quick read. It has a surprising amount of emotional depth — rare for the dystopian teen romance genre — and makes some good points about romances overall in that the best and most realistic romances occur when both people can understand one another or have similar skills and gifts. June likes how Day looks, sure, but unlike other teen dystopian romances such as Lauren Oliver’s DELIRIUM (reviewed here), June is far more concerned about what’s going on in Day’s mind than she is about his looks. That’s not only refreshing for a teen romance, but it’s also extremely realistic. Don’t get me wrong. I felt LEGEND‘s plot, overall, was plausible. The milieu was appropriately dystopian and Ms. Lu didn’t shy away from showing the worst aspects of this. But Ms. Lu also showed that people can survive the worst things with their humanity intact — something that made Suzanne Collins’ original THE HUNGER GAMES (reviewed here by Jason) so good, but otherwise has been rarely imitated — and shows recognizable human emotions and drives throughout. I appreciated this greatly and wish more writers would emulate her example. TEMPTING THE BRIDE — A.